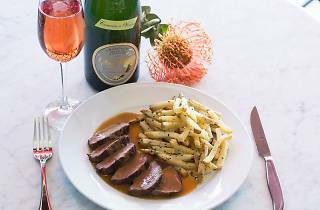 French culinary hub L’Assiette Steak Frites is dishing out the best of authentic cuisine to honor esteemed French journalist and author, Cecile Delarue. In honor of her latest literary venture Everything Easy Cookbook, this transplanted brasserie is collaborating with the French consulate to prepare an evening of gastronomic splendor. Think pate de champagne and gougeres paired with Kir Royals, and—you guessed it— a signature searing plate of steak frites. Enjoy a little taste of France, as well as an in-person meet-and-greet and book signing with Delarue.